O'Malley Chief of Staff John Griffin talks to advocates for disability support workers. 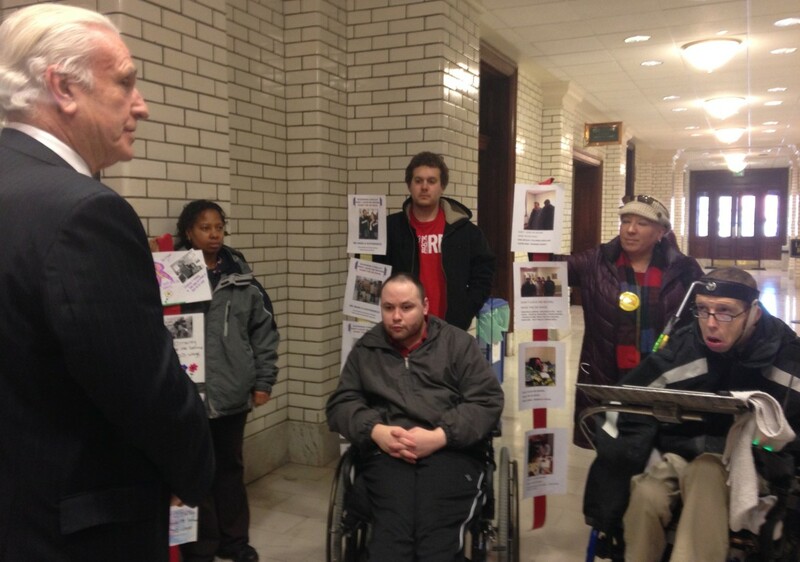 Photo above: Last March, advocates for those with developmental disabilities spoke to O’Malley chief of staff John Griffin. Ken Capone, mentioned in story below, is at far right. Community service providers to the developmentally disabled are “honestly at a desperate point” in continuing to operate, Laura Howell of the Maryland Association of Community Services told the Senate Budget Committee Thursday. The state’s reimbursement for direct support staff “is the lowest that it has ever been,” Howell said. Gov. Martin O’Malley cut their reimbursement in this year’s budget in January, and that level was continued in Gov. Larry Hogan’s budget. A few years ago, the rate was 69% above the minimum wage, now it is just 28% above the minimum wage for all staff, regardless of experience or length of service, Howell said. These low-paid workers take care of over 25,000 people with a range of disabilities, some needing 24-hour care. Howell said providers are discharging staff, closing group homes, lowering staffing ratios and cutting health insurance benefits. Howell said her members tell her that the quality of staff is declining, and because of low wages, good staff members get trained and then go on to work for better pay in nursing homes and assisted living facilities. A 4% increase in the reimbursement rate was negotiated last year as part of a deal to increase the minimum wage for all workers in Maryland. That increase has now been cut in half. “There are no more painless cuts left and this is a recipe for disaster,” Howell told the committee. The Developmental Disabilities Administration has been a troubled agency within the health department for years. In 2012, it was discovered that agency had left unspent $38 million despite having thousands of people on a waiting list for services. The head of DDA, deputy secretary Bernie Simons, gave a brief overview of the status of the agency. Simons came to the agency from Missouri last April, and is the fourth DDA administrator in the last three years. He said his biggest challenges are the restructuring of rates and replacement of a legacy information technology system that is 15 or 20 years old. Service providers were previously paid in advance, and much of the accounting was still done on paper. The agency’s budget is about $1 billion, with about $420 million in federal funds. Simons is also restructuring the agency functions in its headquarters and regional offices. “We are displeased with the cut to the direct wage increase,” Capone said.